The public is encouraged to attend the Wreaths Across America dedication ceremony to be held at noon on Saturday, Dec. 15, at Darien’s Spring Grove Veterans Cemetery. According to local tallies, there are 2,184 veterans buried in the Darien cemetery, the first of three designated official veterans’ cemeteries in the state. The other two are in Middletown and Rocky Hill. Local fundraisers have collected over 1,200 wreath sponsorships for Darien’s Spring Grove Veterans Cemetery this year. Darien’s wreath laying ceremony will be conducted simultaneously with the wreath ceremony at Arlington National Cemetery on Dec. 15, 2018. Many interested local residents are needed to help with the wreath placement this year. People are asked to arrive at Spring Grove Veterans Cemetery by 11:30 a.m. to prepare for the noon ceremony. The local ceremony will be led by David Polett, Location Coordinator for Wreaths Across America, Darien, assisted by Vietnam Veterans John Driscoll and Alan Bixler. In 2018, Wreaths Across America marks the 27th anniversary of the Worcester Wreath Company donating wreaths to Arlington National Cemetery. This year, several Darien civic groups including VFW Post #6933, the Masonic Club of Darien, and Good Wife’s River Chapter DAR partnered with some members of Darien’s Monuments and Ceremonies Commission to collect wreath sponsorships. Many Darien businesses and local citizens also generously donated. Last year, an anonymous donor gave additional wreaths so that every veteran’s grave in the Veterans section of Darien’s Spring Grove Cemetery could be covered with a wreath. The organization’s patriotic mission is to: Remember the fallen, Honor those who serve and their families and to Teach our children the value of freedom. Each year in December, WAA coordinates wreath-laying ceremonies at Arlington National Cemetery, as well as at over 1,400 veterans’ cemeteries and other locations in all 50 states and beyond. This year, for the first time over 9,000 wreaths will be placed at the American Cemetery in Normandy, France. 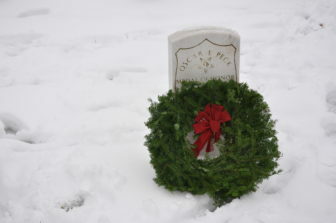 Wreath sponsorships at $15 each can still be made online at WreathsAcrossAmerica.org — click on “Sponsor A Wreath” and at check out include the Darien Cemetery codes: Group ID is CT0007; and the Location ID of CTSGVD. The deadline for sponsorships is Dec. 3, 2018. The public is encouraged to attend the Wreaths Across America dedication ceremony to be held at noon on Saturday, Dec. 15, at Darien’s Spring Grove Veterans Cemetery. Local fundraisers have collected over 1,200 wreath sponsorships for Darien’s Spring Grove Veterans Cemetery.